Are you looking for SD card security cameras that save motion footage to a memory card locally instead of uploading it to a cloud server? Or in the search for a battery-operated motion-activated security camera with SD card? Or maybe outdoor (wireless?) security cameras with an SD card slot to keep footage offline? Yep, this is the right place for you. And, you could learn some helpful tips along the way. A memory card or a micro SD card in IP cameras or CCTV cameras is primarily designed to store motion-activated recordings, a short video clip of movement. A standalone SD card security camera with local storage offers a cost-effective alternative to the subscription-based cloud storage. Security cameras with SD card help save motion footage locally in a remote area or place with limited or no internet. Just like one user said, “looking for a camera to place at an old garage shop, no wifi there so it would have to record to an SD card when motion is triggered”. Besides, SD card security cameras make video footage safer from snooping and keeps the footage offline. Many security cameras with local storage (built-in SD memory card, SD card slot or USB backup) are popular with consumers who are looking for a video monitoring solution in remote locations or isolated areas with limited or no WiFi, say, like a farm, shed, ranch, boat or summer home. Security cameras with SD card (slot), especially battery-operated security cameras like Reolink Argus 2, also appeal to people who opt for motion recording locally instead of cloud-based or monthly subscription-based service. In short, security cameras with micro SD card are increasingly popular with homeowners, business, and hobbyist alike. We list out some popular and quality IP/CCTV cameras with SD card available on the market. Reolink Argus 2 is an outdoor battery-operated security camera with an SD card slot, which supports up to 64GB local storage of motion-activated recordings. The memory SD card for this standalone wireless security camera can capture up to 1,500 motion events in a loop before it will, regardless of the capacity, overwrite itself automatically. Users can remotely playback saved videos right on the Smartphone apps. The battery-powered outdoor security camera with SD card local storage works extraordinarily well in places with difficult access to an electrical outlet, places like the front door, driveway, inside a car, vacation home, farm, boat, RV, ranch, remote locations, etc. If you’re after a more indoor-like standalone camera with SD card, Reolink Keen, the motion-activated security camera, also supports local storage to an additional SD card. 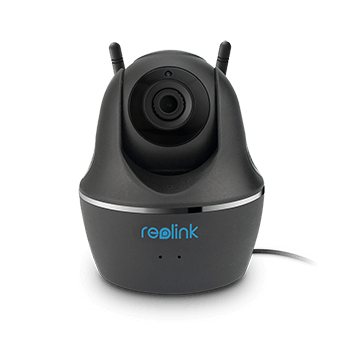 Reolink C1 Pro is wireless security camera with SD card slot that supports up to 64GB worth of movement footage. It is incredibly easy to setup and use, even for the elderly. It can also rotate to change pointing angles (355° pan/105° tilt) to take an easy sweep of the room or premise with a tap on the apps. This wireless IP security camera is popular with tenants, the elderly, and parents with babies, nannies and pet owners and this standalone IP camera with SD card slot is commonly used inside a small apartment, single-family house, office, workshop, vacation home, hotel, motorhome, or RV. (Check out the hands-on review). 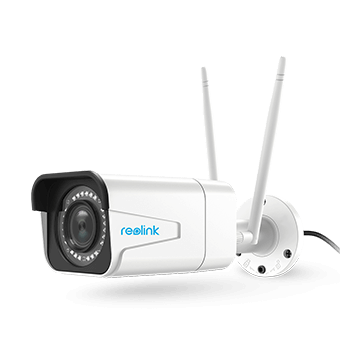 Reolink RLC-410 is an outdoor security camera with an SD card slot and solid metallic body (rated as IP66 waterproof). It doesn’t require a monthly subscription fee or mandatory cloud-based service. The local storage security camera could work independently and record movements to the SD card. Users could connect this wired security camera with SD card slot to the Reolink PoE NVR for continuous recording, configure it upload footage to an FTP server, or record videos to NAS like Synology surveillance station. It’s great for residential areas surveillance and business surveillance like office, apartment building, condo, garage, front door, and driveway. Below is a video shared by a user of Reolink RLC-410 SD card security camera. In areas where power supply or internet access is hard to come around, solar-powered security cameras with SD card (slot) come in handy, for example, Reolink Go solar-powered security camera with SD card recorder and cloud storage. 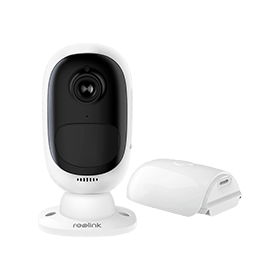 Reolink Go is a rechargeable battery-powered 4G-LTE outdoor wireless security camera with a Micro SD card slot (supports up to 64GB) for motion-activated recordings local storage with or without WiFi or internet. Reolink Go works extraordinarily well in places with difficult access to WiFi/network and an electrical outlet, places like the warehouse, construction sites, farms, docks, RV, trailers, cabins, log houses, front door, driveway, inside a car, vacation home, farm, boat, RV, ranch, remote locations and etc. Solar-powered security cameras with SD card storage will do the trick, for example, the re-invention of Reolink RLC-411WS on YouTube. It turns the wireless outdoor camera into a solar-powered security camera with SD card. 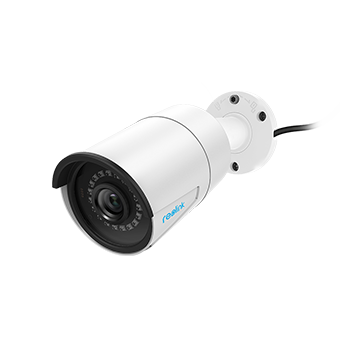 RLC-511W is an outdoor waterproof IP camera with SD card slot so you may insert the SD card according to your monitoring needs. Generally speaking, a 16GB micro SD card is capable of storing up to 400 motion events before overwriting itself automatically. That means it could record up to months of motion-triggered footage under normal circumstance (say, 5 times a day). Then again, it largely depends on how often the IP camera is triggered on a daily basis. RLC-511W wireless outdoor security camera with SD card recorder supports 2.4/5GHz WiFi, 5MP Super HD video quality, 4x optical zoom, 100ft decent night vision, motion detection & alerts, motion zoning & schedule. Here is one video example showing how RLC-411WS wireless security camera with SD, the first generation of RLC-511W, performs in real case scenarios. We gather some frequently asked questions when it comes to SD card security cameras, selecting an SD card for a security camera, or troubleshooting issues with the security camera memory card and recording. It largely depends on these key factors, such as the micro SD card capacity, bit rate (or Bitrate), frame per second (FPS), and resolution. 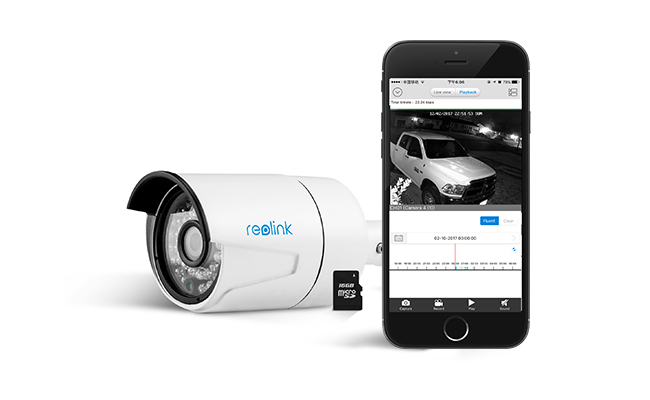 For example, a security camera with 16GB SD (built-in or insert later), like Reolink RLC-410WS could record up to 36-hour-long motion videos. Many SD card security cameras usually will record both standard-definition and high-definition video at the same time. Of course, users are able to change it in the setting accordingly, like Reolink security cameras. Almost all micro SD card used in security camera record in a loop and will overwrite old files when it’s full. There are two factors you should take into account when choosing a right micro SD card for security cameras with memory card: speed class (types) & capacity. Make sure you choose the right type of micro SD card, or right speed class (a number indicates minimum write speed) for local storage security cameras, say, Class 10,6,4, and 2. The higher the number it is, the faster it can write. Class 4 or higher SD card like Samsung 64GB memory card and SanDisk Ultra 64GB micro SD card is commonly used in high-definition video recordings, for example, like Reolink Argus 2. Besides, make sure the capacity of SD card fits your CCTV or IP security cameras. Many IP cameras with SD card don’t support 64GB or 32GB SD card. Another important heads-up is to make sure you get the right size SD card for security cameras with SD card slot. Some surveillance cameras with SD card onboard allows users to review footage stored in micro SD card right on the apps, and download too, for instance, Reolink security cameras with SD card, like Reolink Argus 2, Reolink Argus. Of course, to do so, both the camera and your Smartphone are connected to the network. Some, on the other hand, can be viewed when being taken out and read it on a computer via an SD card reader. Every now and then, it happens. The memory card won’t record motion; your security camera can’t recognize or format the SD card, or the camera stops reading the memory card. First of all, make sure the SD card is properly inserted. Make sure the camera’s setting is okay. Try replacing the old SD card with a new one, if possible. Format SD card if your security camera stops reading SD card. Just a heads-up, the available storage of micro SD card could possibly shrink after formatting through apps, as to boost the overall read-write efficiency. No doubt, it’s much easier and simple to store and save motion-triggered recordings and video footage in memory card locally. However, troubles will lurk if you are leaving your security cameras in a plain sight without backing up any forensic video evidence whatsoever. Therefore, regular checking footage or transferring older videos to a computer or uploading to FTP server is helpful to retain useful footage without being taken away or overwritten by new files. This entry was posted in Buyer's Guide and tagged cctv camera with memory card, ip camera with sd card, security camera with sd card. can we replace the SD cards on the ones that come with 16Gib to say 128Gib? Hi there, you could use microSD (up to 64GB) on many Reolink security cameras, such as Reolink C1(/product/c1/), Reolink C2 (/product/c2-series/), Reolink Keen (/product/keen/) and Reolink Argus (/product/argus/). How does the system work? I first purchase the camera and solar panel; then, I guess I download the Reolink app on my Android cell phone. But, my Galaxy 8 phone is Verizon supported. I understand the Reolink Go needs AT&T internet access…true? So, your suggestions and advice are most welcome. I need a security system like the Reolink Go to keep tabs on my boathouse and boat, about 1`35 miles away from my residences. What kind of internet support is required to make the system work well? Thanks! Hi Gary, Reolink Go operates based on a mobile network. So if your place has 4G or 3G mobile networks covered, it will perform to your needs. And you’ll need to purchase a SIM card to work with this cellular security camera. Currently the supported network service suppliers include the nationwide AT&T (U.S.), T-Mobile (U.S. & Germany), EE Limited (UK), Vodafone (UK, Germany & Italy), O2 (UK & Germany), Three UK, and Wind Tre (Italy). Can I just take the SD card and put it in my laptop to review motion detected recordings with the Argus 2? I’m older and not tech savvy and do not have or want a cell phone. I have a neighbor that plays pranks on me by putting crap on my front yard and other diabolical, 10 yr. old child type pranks. I want to get video proof to prosecute. Hi, Bartizal, you can certainly insert a Micro SD card into the Reolink Argus 2, and then put the SD card in your laptop to review motion triggered recordings. Reolink Argus 2 also features 1080p high resolution and starlight night vision, so you can get crystal clear images and videos as the proof to prosecute, /product/argus-2/. If you have any more questions, plz feel free to let me know. How long does the camera record video on motion? Is there an option to set the time limit? Also will the camera continue to record video if there is motion in the cameras view lets say for 20 minits? Hi, Terry, as for how long the camera can record videos on motion, you can refer to the FAQs in my post above. And yes, the camera will continue to record videos if there is motion event (each recording file lasts for 5 minutes in the daytime and 2 minutes at night).